ORLANDO, Florida — For close observers of the United States men’s national team, the news really shouldn’t have come as a shock. For weeks, it’s been obvious that new USMNT coach Gregg Berhalter was toying with the idea of playing 20-year-old central midfield phenom Tyler Adams, who has been crushing it in the middle in the German Bundesliga, at right back. That would require veteran DeAndre Yedlin, the starting right back for Premier League side Newcastle United and the first choice there for the U.S. since his breakout 2014 World Cup, to move up to the wing. Berhalter finally confirmed those plans on Monday. 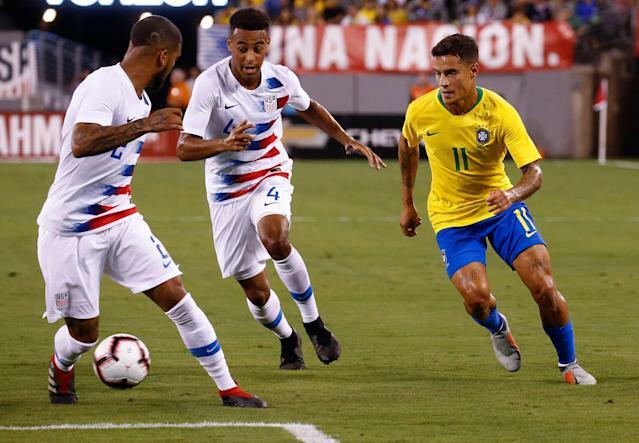 “Tyler, we want to use as a right back,” Berhalter said flatly, during a wide-ranging conversation with reporters three days before the Americans meet Ecuador in a friendly at Orlando City Stadium. If the reaction on social media was anything to go by, many fans aren’t feeling the decision. It’s not hard to understand why. For much of the 2014 and 2018 World Cup cycles, then-U.S. coach Jurgen Klinsmann displayed a penchant — some might call it an obsession — for shifting players out of their natural positions. Klinsmann tried midfielder Jermaine Jones in central defense. He used center backs Matt Besler and Michael Orozco on the outside. He even deployed defensively challenged reserve attacker Mix Diskerud as a destroyer, in an away World Cup qualifier no less. Given that history, no wonder some supporters are triggered. But while Klinsmann seemed to tinker on a whim when it came to both positions and lineup choices, usually with no apparent method to his madness, Berhalter has clearly spent a lot of time thinking this possibility through. “DeAndre is a player — and I had a conversation with him today about this — we’re not going to ask him to do things he’s not comfortable with,” Berhalter said. “We’ll adapt to him to a certain extent. I’m watching all of his games and what I see with him is a tremendous ability to build momentum from behind with his speed. “He has a good cross, and he’s primarily used in wide positions,” Berhalter added. What Yedlin isn’t quite as good at is actual defending. For all his experience at the highest levels, he still switches off in crucial moments. Add in the fact that Berhalter’s system requires fullbacks to find the ball centrally and sometimes even play with their backs to the opposing goal, and Yedlin’s particular qualities always seemed like a less-than-ideal fit. Still, the majority of Monday’s hand-wringing seemed to center around Adams. Over the last two months, the former New York Red Bull has been a revelation as a two-way, box-to-box midfielder for sister club RB Leipzig. It’s reasonable to wonder if his endless stamina and blossoming attacking skill would be wasted at right back. But with fellow Bundesliga-based 20-year-olds Christian Pulisic and Weston McKennie slated to man the “dual 10” role in Berhalter’s 4-1-2-3 scheme, the coach seems to think that Adams would be more shackled in a pure holding role. That spot seems destined for a deeper-lying, stay-at-home type. It’s clear that Adams will have plenty of leeway to influence games, whether that’s in the middle or out wide.